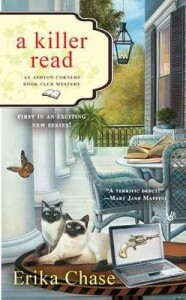 Linda Wiken (who writes as Erika Chase) will be in the store on Saturday, May 26 from 11:00am to 1:00pm signing copies of her new mystery novel “A Killer Read” – the first in an exciting new series! “Reading specialist and mystery book lover Lizzie Turner was excited for the first meeting of the Ashton Corners Mystery Readers and Cheese Straws Society hosted in Molly Matthew’s old Southern mansion. But she didn’t expect the gathering to become the scene of an actual murder. A stranger has been shot – and nobody knows who the victim is, or how Molly’s antique gun came to be used as the murder weapon. Come on down to the store on Saturday to meet the author, buy a book, and get it signed! We hope to see you then!